Felicity Luckey is the creator and author of the book ‘Great Minds Think Fit’. Born in the year 1967, this ingenious woman and excellent writer began reading well before she started walking. Felicity herself used to love collecting quotes and sayings from magazines. Today Felicity’s quotes are a great source of inspiration to sports people. Felicity’s adages have a profound impact on people who are trying to improve the quality of their lives by getting fit. Felicity is also the owner of the online store Great Minds Think Fit. This website is an online poster store as well as a motivational website. 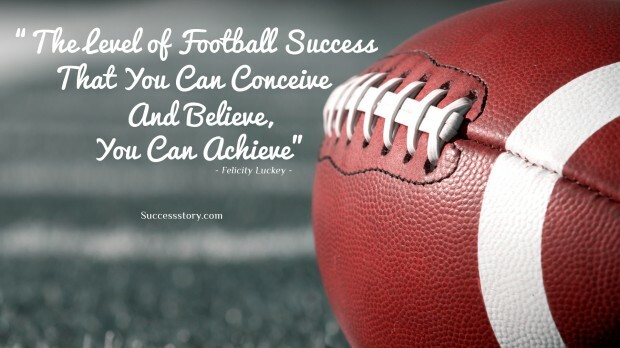 "The level of football success that you can conceive and believe. You can achieve"